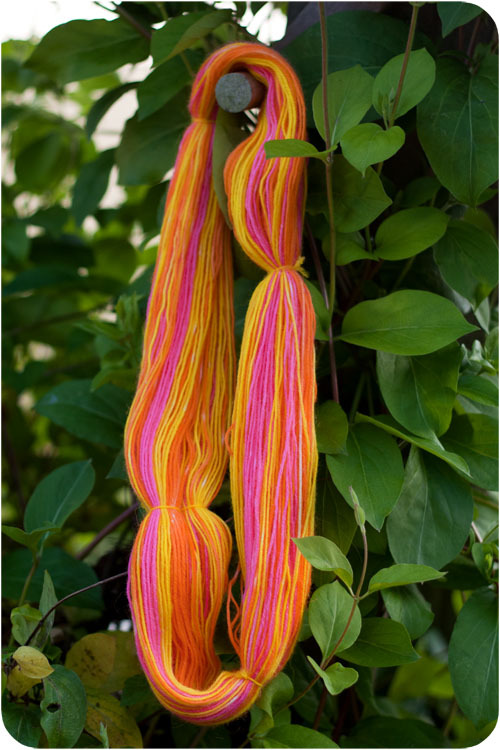 I was browsing my favorite knitting blogs the other day, and came across this post by Simply Knitting, "DIY Self Striping Sock Yarn with Easter Egg Dyes". 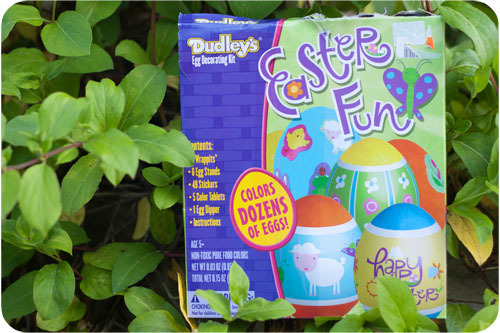 The very next day, my local Goodwill had a set of 6 Easter Egg dyeing kits marked down to a dollar - so the dyeing was on! I picked up some ivory colored "Heart and Sole" at JoAnns with a 50% off coupon, and armed with my neon colored egg dyes, set off on my very first dyeing adventure! 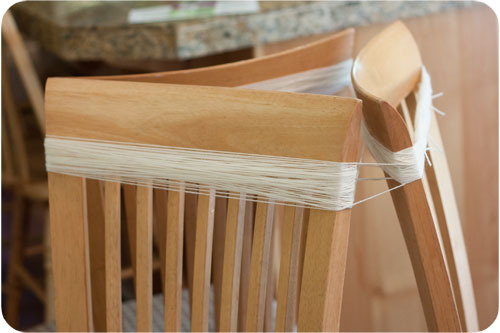 At this point, I decided to make my self striping yarn in three colors, so I wound the skein around three chairs (wrapping each chair about 10 times before moving onto the next chair). I also cut twelve small pieces of yarn to use as figure-eight ties, to make sure I would be able to untangle my mini-skeins after I was done dyeing the yarn. 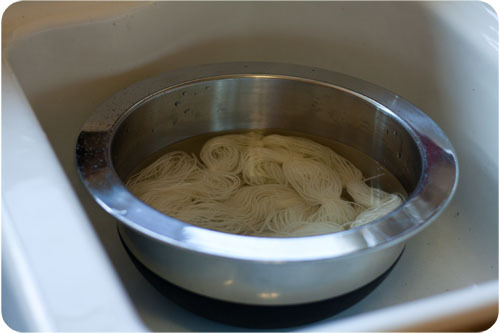 After I was done tying the yarn, I slipped it off the chair backs and placed my separate (but still attached) mini-skeins in water with a little vinegar to soak for at about 25 minutes. While my yarn was soaking, I prepared my dyes by following the package instructions. 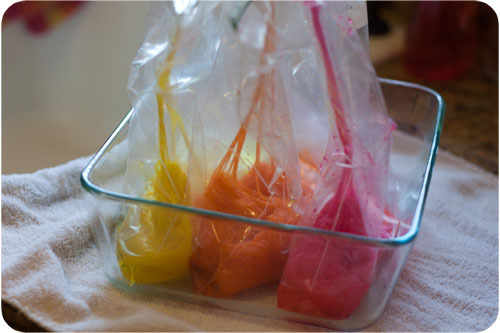 I knew I wanted to use the yellow, orange, and pink - so for the yellow/orange dyes, I dissolved each dye pellet in its own ziplock bag with 1/2 cup warm water plus 3 T of white vinegar. The pink dye does not call for any vinegar, so I just added it to its own bag with just the 1/2 cup of warm water. After my yarn was done soaking, and the dye pellets had all dissolved, I placed each mini-skein of yarn into the corresponding baggie. I did leave a teeny bit of white at the point where the yarns meet, because I assumed that the dye would wick up the yarn and I didn't want the colors getting too muddy where they meet. 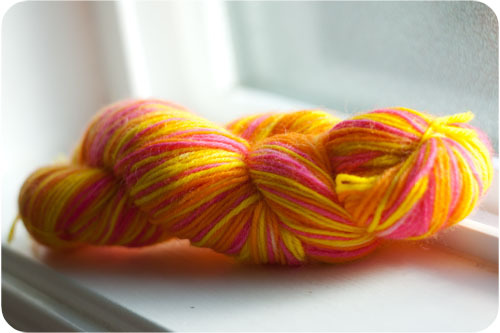 Yes... it is definitely a tad Day-Glo... but I know AT LEAST one little girl who will squeal with delight for anything made out of this yarn! Speaking of which... I couldn't wait to cast on and see how these were going to knit up, so after a couple days of knitting, Little E now has day-glo socks, lol! 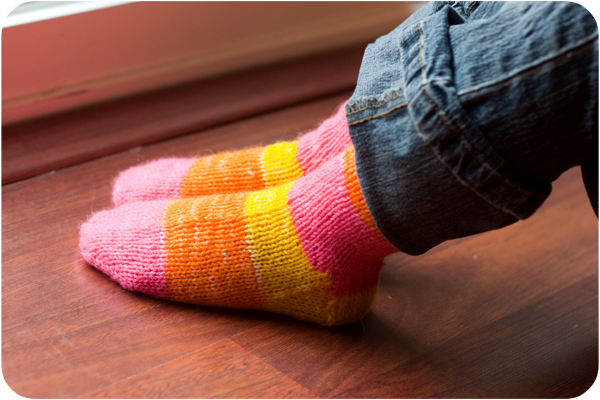 The socks are just my standard magic loop, using the directions from Kelley at KnitPicks (love those free videos). For sizing: I measured around the widest part of her foot, and came up with 6.5 inches…. so minus 1” of negative ease gives me 5.5”…. and with a gauge of 6 st/in, that gives me 33 stitches to cast one. I rounded up to 36 stitches for an even number for the ribbing. I love the thick stripes on this pair! Mystery Box & a Freebie!